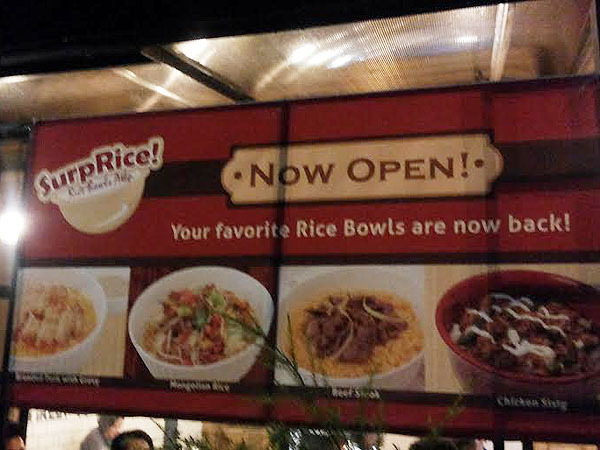 I wonder what's in each rice bowl. Spotted by Fred of The Exaggerated Zeal along Burgos St. Tacloban City, Leyte. 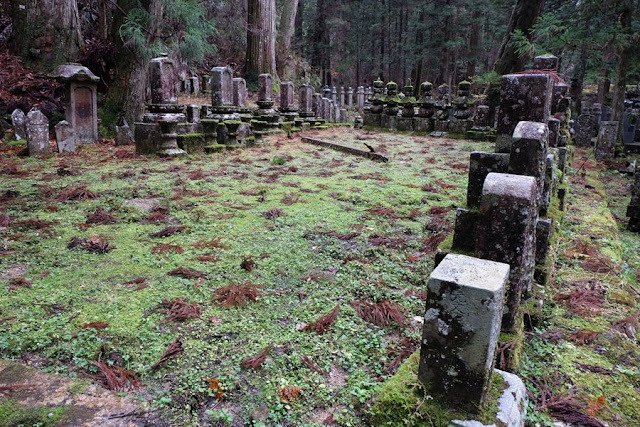 Okunoin (奥の院) is Japan's largest cemetery, with about 200,000 tombstones along a 2-kilometer stretch. 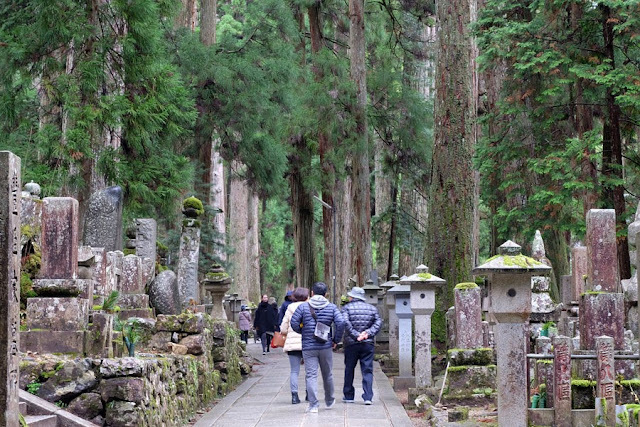 At the end of this stretch is the mausoleum of Kobo Daishi, the father of Shingon Buddhism. My trips (abroad or anywhere for that matter) usually do not involve a visit to a cemetery (except, maybe, when the trip is to one's hometown during All Souls Day). 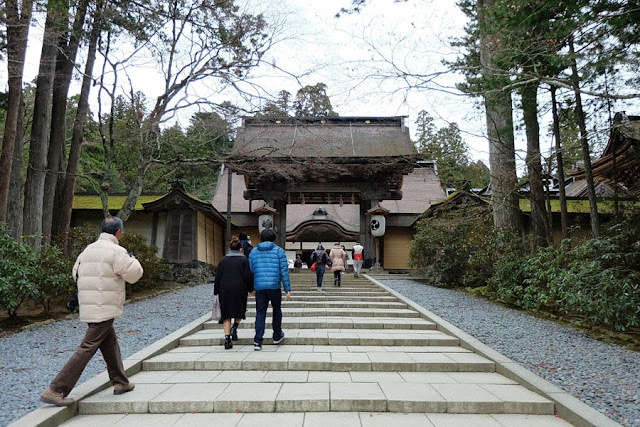 Sure, I read about Okunoin—it didn't look too interesting—but because it is one of Koyasan's two most sacred sites (the other one is Garan), I added it to my itinerary. To be visited if time permits. The end result? 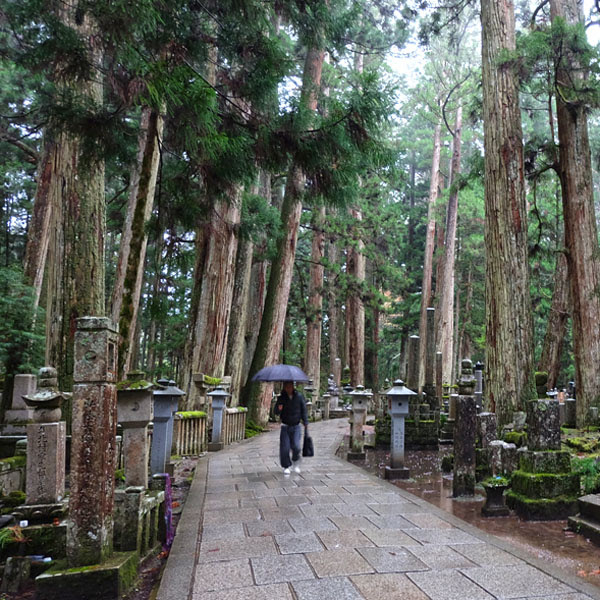 I visited Okunoin three times. 6PM? I dunno, but a few minutes into the walk it sure got really dark. It never crossed my mind to visit a cemetery at night. By myself, at that. But why in the world did I go? Because the guesthouse staff suggested so. And I never questioned why. In the gloaming, I put on my jacket and started my journey to the unknown cemetery. 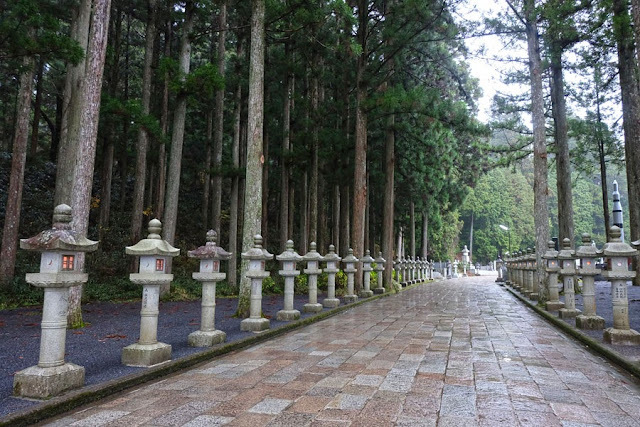 I entered Okunoin at the newer approach, which is just a few minutes' walk from the guesthouse, near the last bus stop. This approach would cut the distance to the mausoleum in half. 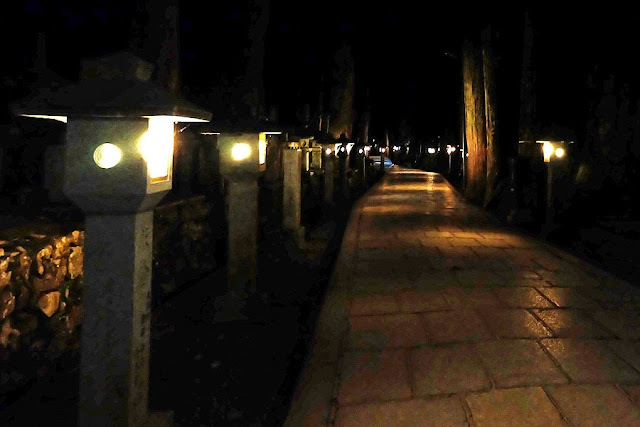 The pathway was lit by stone lanterns. For the first hundred meters or so. After that, the lanterns were few and far between and I had to use my smartphone's flashlight app to light the way. I encountered three or four people (were they really people? Or ghosts? Haha!) but they were going in the opposite direction, towards the cemetery exit. Around the halfway point, I heard some movement somewhere ahead of me and to the left, but it was so dark, all I could see were silhouettes of tombstones. I moved slowly towards the noise but stuck to the path's rightmost edge. As I neared, a shadow of a man rose from behind the tombstones and it turned and looked my way, and I walked away as quickly as I could. (What was the man doing there, in the dark?!) It gave me the heebie jeebies. The next morning I took a closer look at the area where the noise had come from. It was at the tombstones around the bend. I reached the point where the newer path connects with the traditional path. It was dimly lit with stone lanterns. The rest of the way was uneventful and all I could hear were the soft whisper of leaves of the towering ancient cedar trees, invisible creatures lurking in the dark, my heartbeat, and my footsteps on the stone path. 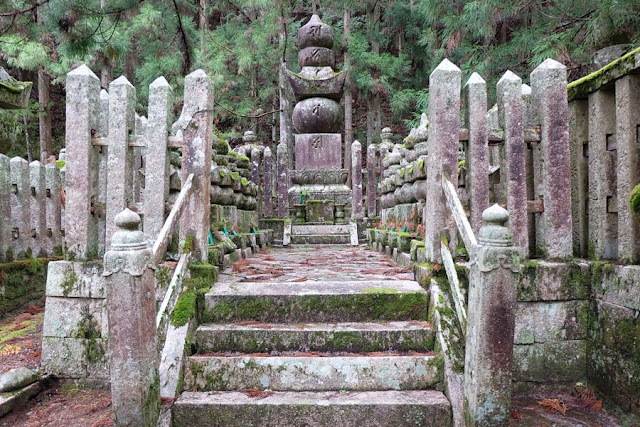 I arrived at Gobyo no hashi (bridge to the mausoleum), which marks the entrance to the mausoleum of Kobo Daishi. 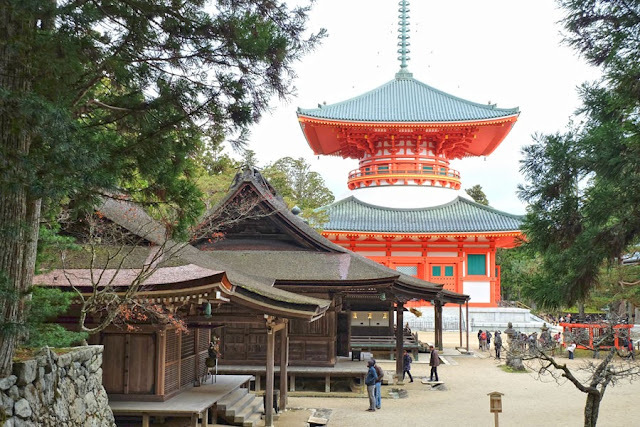 Beyond the bridge was Torodo (Lantern Hall, the main hall of worship) and, behind that, Kobo Daishi Gobyo (Mausoleum of Kobo Daishi). My alarm rang at 5AM. I hoped no else woke up to it. The guesthouse was quiet and dimly lit; only one other person was up and he was on his way out. I could hear the pitter patter of rain on the roof. It's going to be very cold out there. I dressed up in a layer of long-sleeved shirt and fleece jacket, and I made sure to wear my thermal long johns underneath my denim pants. I grabbed my camera (though, like last night, I knew won't be able to take photos in the dark and beyond the bridge), my phone, and my umbrella, and stepped out onto the cold, wet dawn. Why go again, in the not-so-dark? To hear the monks chant at Torodo. 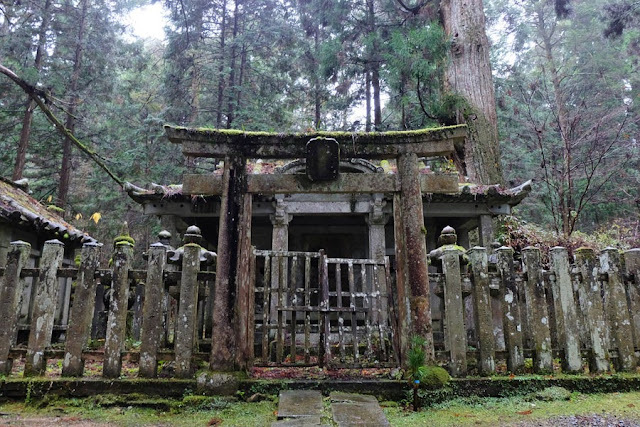 Like the chanting of the monks I heard yesterday afternoon in front of Konpon Daito in Garan, this too was enchanting. But, unlike yesterday, there were only a handful of monks chanting in an enclosed and beautifully lit Lantern Hall, a solemn and captivating atmosphere. This definitely made getting up very early and walking in the 2-degree-centigrade morning rain worth all the trouble. I stepped out of Torodo after the monks had left. The sun had already risen. I went back to the guesthouse to have breakfast. 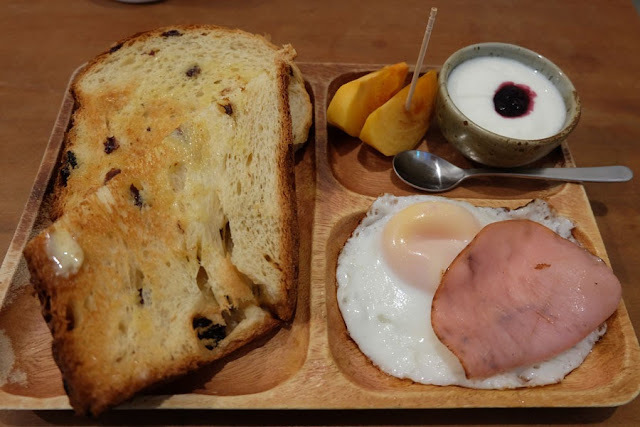 After eating my bread, egg, ham, fruit, and yogurt, I decided to go back to Okunoin a third time! 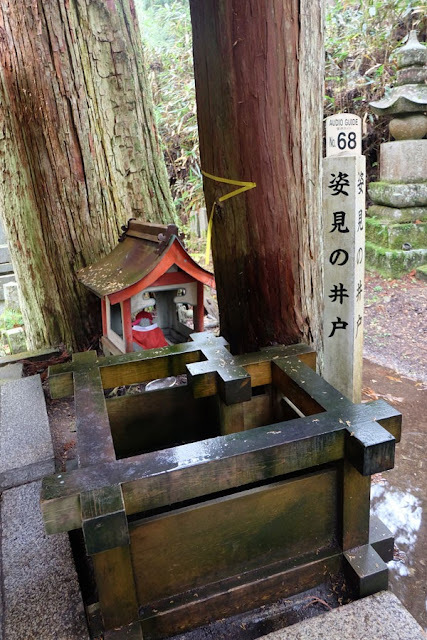 This time I would begin at the traditional approach and walk the entire 2-kilometer path while listening to the tidbits that my audio guide had to share about the tombs around Okunoin. 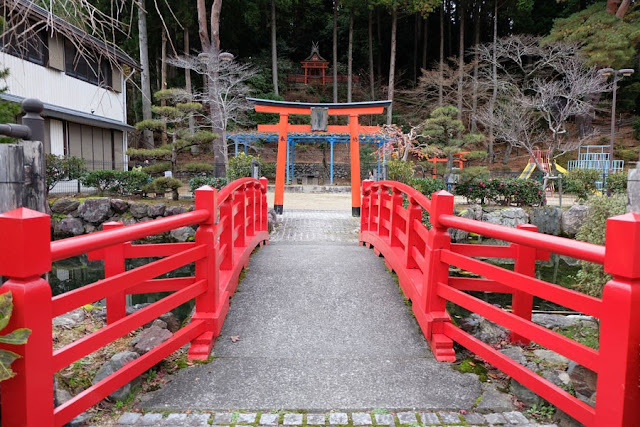 I walked off the morning cold from the guesthouse to Icho no Hashi (first bridge), the traditional approach to Okunoin. 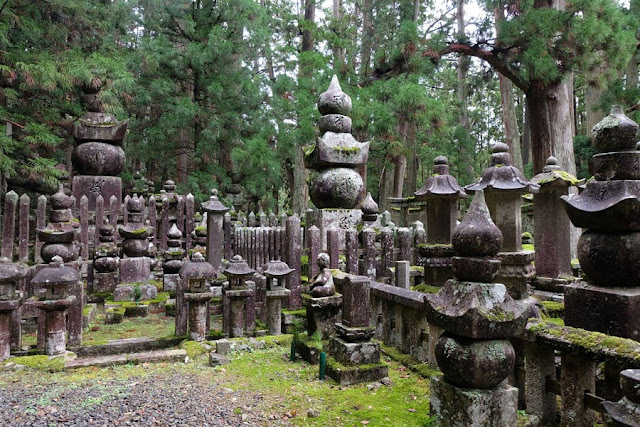 I switched on my audio guide and my OC mode: my goal was to see all the tombstones and important stuff (like the stone upon which Kobo Daishi sat) listed down in the audio guide's pamphlet. 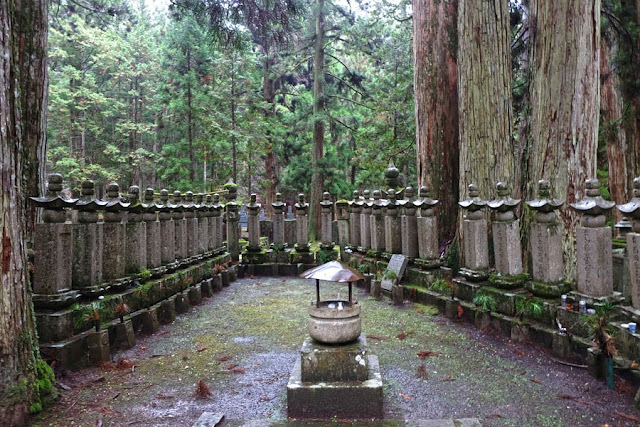 It was interesting to see the tombstones, especially the really ancient ones all covered in moss, and to hear about the important people these tombstones were for. 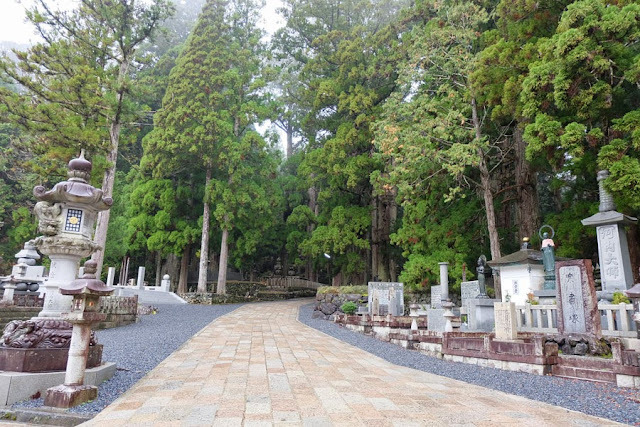 Aside from the tombs, other interesting things around the cemetery were the towering ancient trees, the sugatami no ido (Reflection Well), Zeni Jocchi Memorial, the Jizo statues adorned in red bibs and hats, and the Miroku-ishi (Miroku Stone). 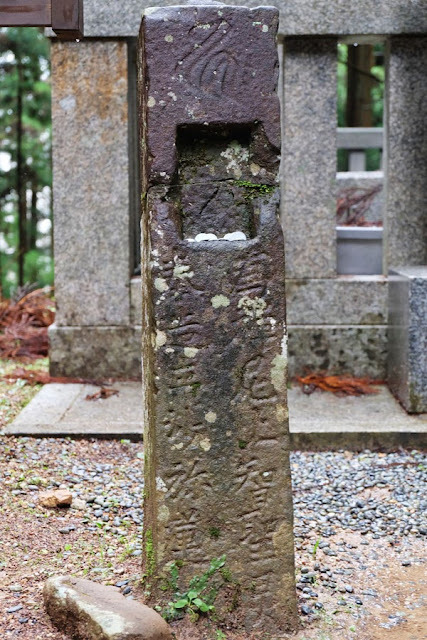 The Zeni Jocchi Memorial is a small unassuming stone post. 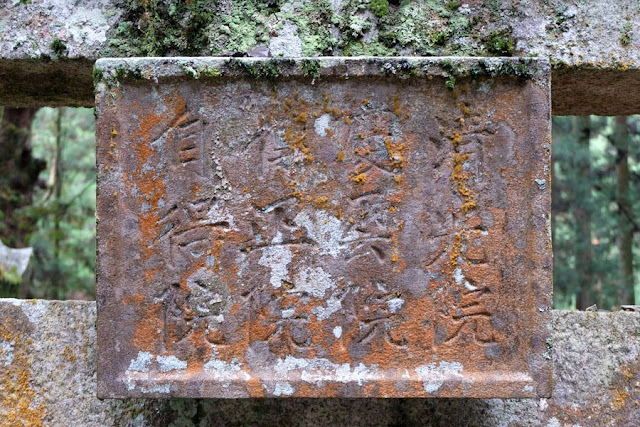 This is a memorial for a Buddhist nun with the year 1375 inscribed on it. Doesn't look anything out of the ordinary, but go down on your knees, put your ear on the stone, and listen. You will hear the cries in hell! So they say. I didn't want to hear those cries (true or not), so I just took a photo of the memorial. 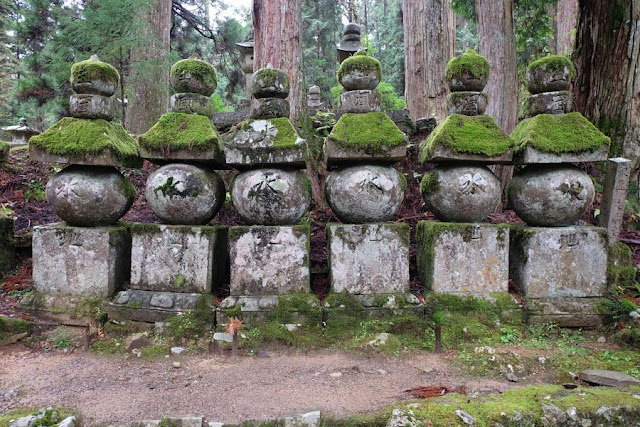 There were many Jizo statues of different sizes around the cemetery. 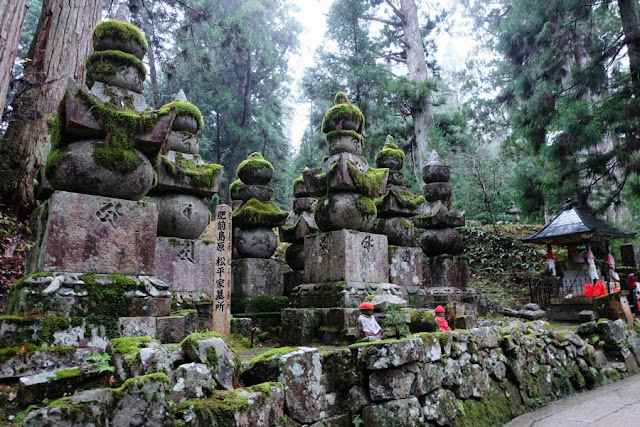 Jizo is the guardian of children and travelers. 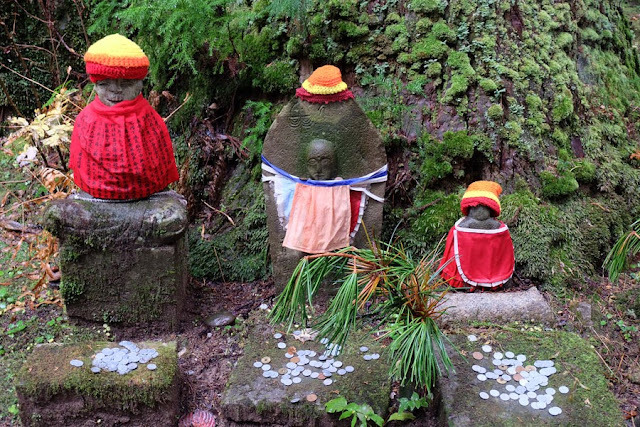 Many of the Jizo statues were adorned with bibs and hats in the hopes that Jizo will keep the deceased children warm in the afterlife. 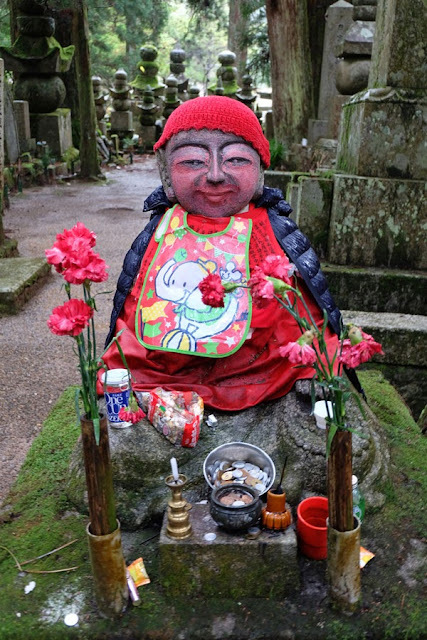 This Jizo statue is warm and toasty in its black down jacket. Guess that's why it's smiling. Beyond the Gobyo no bashi (no photo zone!) 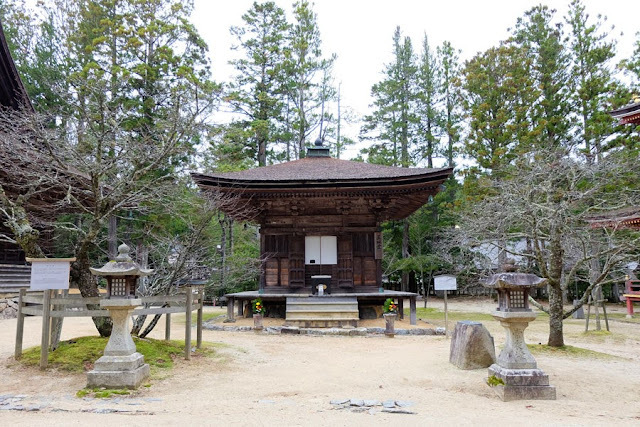 is the Miroku-ishi (Miroku Stone) housed in a small cage with a hole where one can fit an arm. Inside is a lower and upper platform with the Miroku Stone on the lower platform. 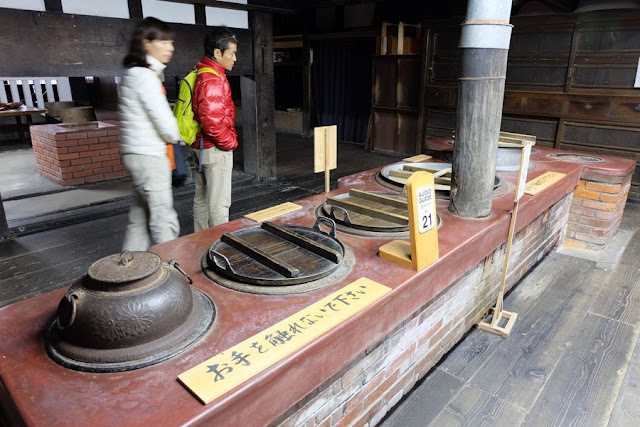 It is believed that if one can lift the Miroku Stone from the lower to the upper platform, then he is one of the good people. (The more your sins are, the heavier the stone is.) I guess I have a long confession to make: I couldn't transfer the stone to the upper platform. 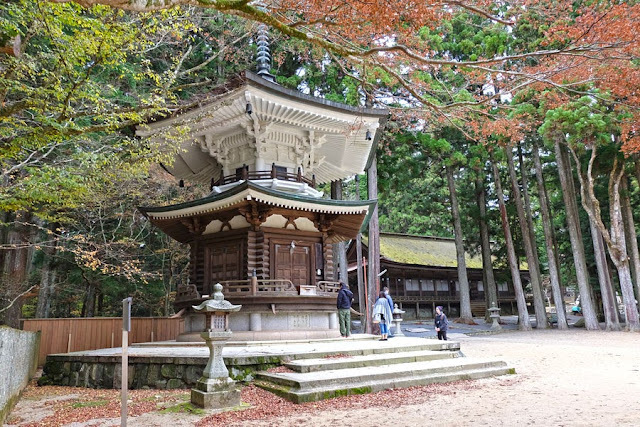 If you do decide to go to Koyasan, a visit to Okunoin with an audio guide is highly recommended (without an audio guide all the tombstones will eventually look and feel the same). 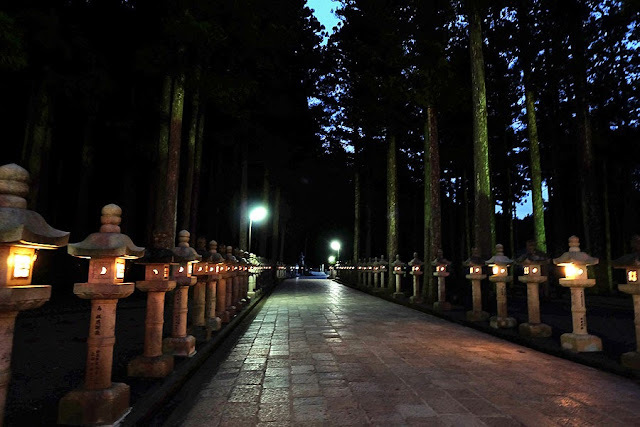 If you can stay a night in Koyasan, take time to visit Okunoin at dawn and at night. Just leave Sadako your imagination behind especially when you go exploring in the dark. The moments I remember most when I traveled to Japan by myself were not the sights, although yes they were quite beautiful, but the random people who stopped to chat with me. 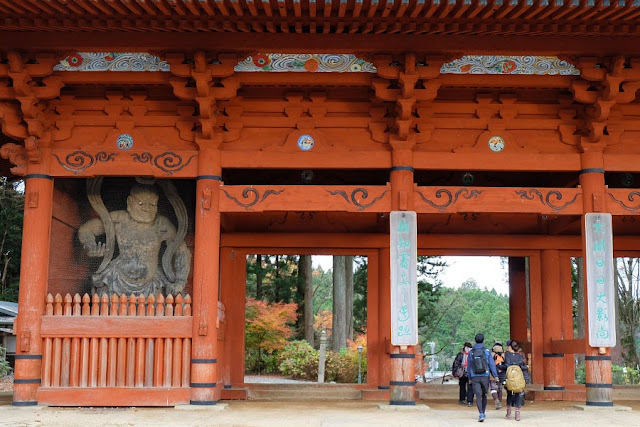 From Daimon, the enormous gate that marks the entrance to Koyasan, I walked and walked and walked because I didn't have the patience to wait for the bus. Besides, it was such a lovely, cold day; a good day for a walk and I wanted to see the town, not just zoom past it. Half an hour later, I was still halfway to my guesthouse. The light was fading and the temperature was dropping. I stopped at a bus stop and checked the schedule. If I understood it correctly, a bus was scheduled to arrive in 10 minutes or so. So I stood and waited and gazed at the farthest point in the road to see if any bus was coming. Tick tock, tick tock. No bus in sight, but an open bed truck slowed down and parked near where I was standing. The pudgy driver, maybe in his sixties, in grey overalls, got off his truck and smiled and talked to me...in Japanese with a sprinkling of English words. He asked me a few curious questions like where I'm from, if I was traveling by myself, etc. It was a welcome small talk. Did the bus ever come? No, and I resumed walking. The bus did catch up with me a stop or two away and I got on. I have an unlimited bus pass, so why not? 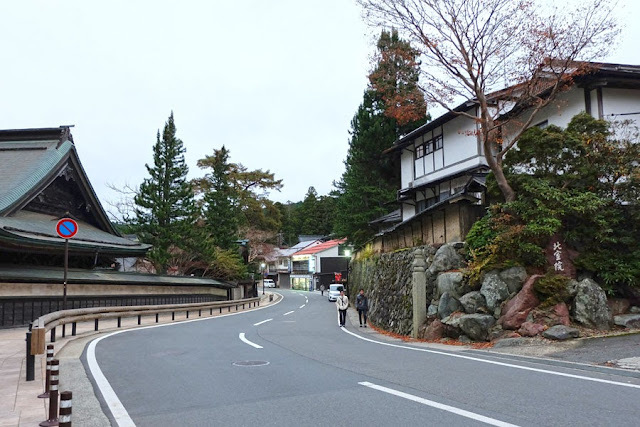 I got off at the last stop and from there I walked along the slightly uphill sidewalk to Koyasan Guesthouse Kokuu, where I would be staying for the night. I came across a stooped, grey-haired woman walking towards me. She smiled and I smiled back and she started talking to me...in Japanese. All in Japanese. Not a word in English. She happily chatted on (I had no idea what she way saying) and she asked me a question. She repeated it three or four times and made some guesses (but I still could not understand the question and what her guesses were) until she said Taiwan and I finally figured our what the question was: Where are you from? It seems to me the elderly are more curious about foreigners than the young ones. I would have wanted to strike up a conversation with the locals especially those about my age, but I wasn't sure if a stranger talking to them would be welcome. Are the younger generation aloof? Or just shy? 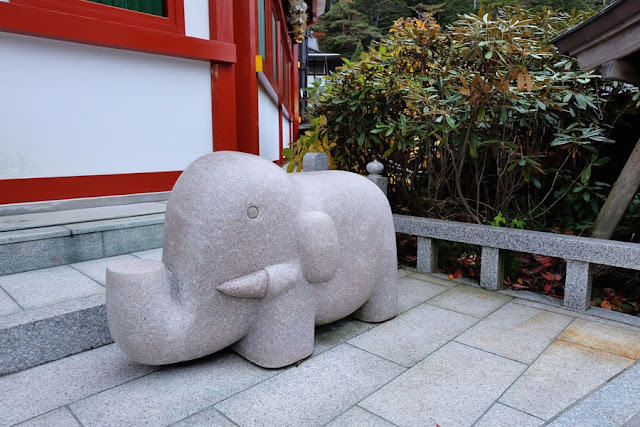 I switch on my audio guide and listen to a short introduction about Koyasan as I walk westward to my first stop: Kongobuji Temple, a UNESCO World Heritage Site. 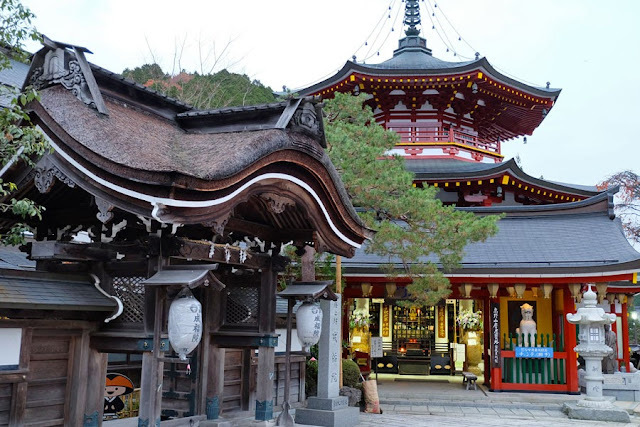 Kongobuji is the head temple of Shingon Buddhism. I enter the temple grounds through its main gate which is the oldest building (1593) in Kongobuji. In the past only royalty and the chief priests could pass through this gate. Today, everyone can pretend they are royalty. 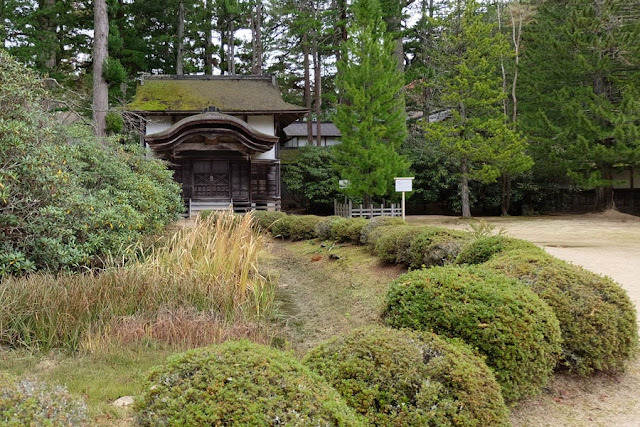 Inside the temple grounds, to the left of the gate, I see a small lonely building surrounded by trees. This is the kyozo (1679), a storage for all the temple's important articles. There is moss growing on its roof. It is closed. I wonder if it's musty inside. To the right of the gate, the audio guide tells me, is the shoro or bell tower. I can't see the bell because it is a bell tower with walls, a type that is called hakamagoshi. I wonder if its bell is still being rung and when? 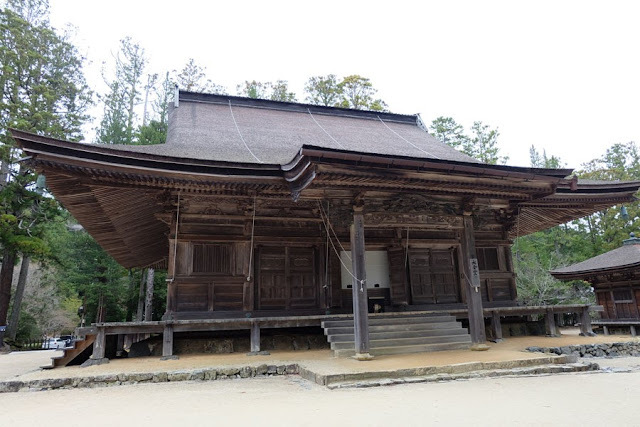 And directly in front of me, Kongobuji with its thick thatch roof...and, strangely, wooden buckets on the roof. I learn that these buckets are called tensuioke or rain barrels... you know, in case of fire. The temple has two entrances. The main entrance, like the main gate, is only for royalty and for the chief priests. This is fenced off: no entry! I and the other visitors enter through the smaller entrance and pay the admission fee. 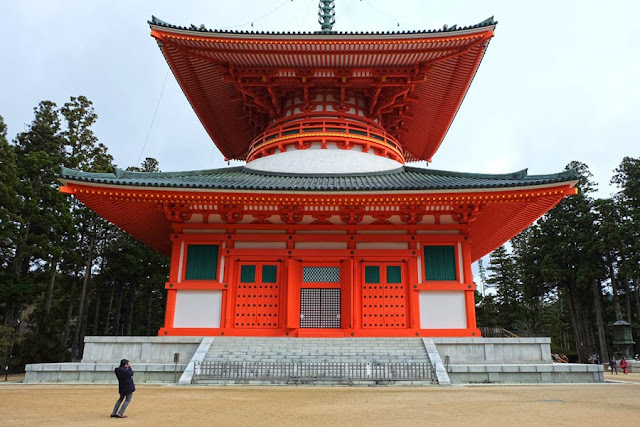 The temple is quite big and I walk slowly from room to room, listening to my audio guide and following the map of Kongobuji on the brochure that came with it. 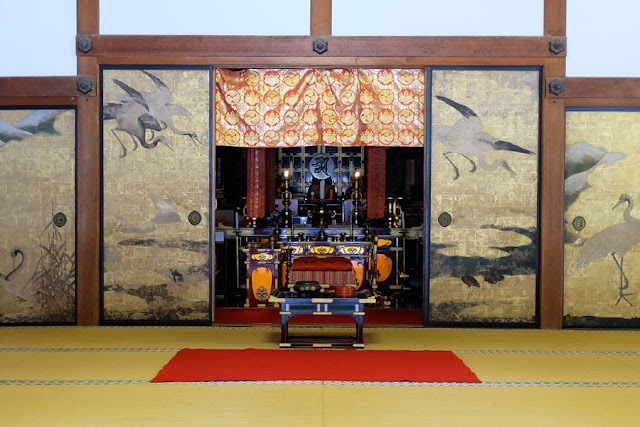 First a spacious room with paintings of pine trees and cranes on its golden fusuma (sliding doors). 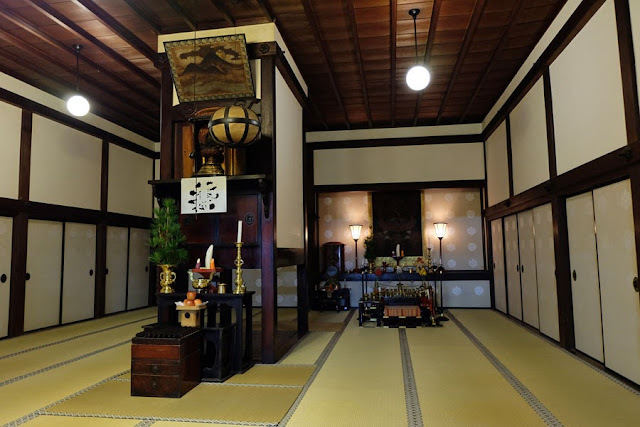 This room is the Ohirama or the Main Hall where important ceremonies are held. 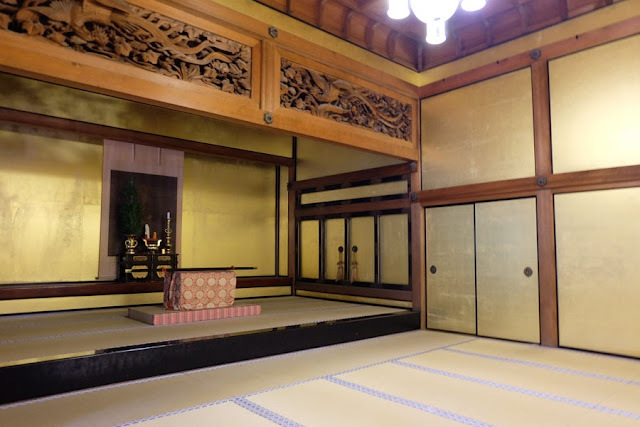 Also in this room is the Jibutsuma, an altar where Kobo Daishi, the founder of Shingon Buddishm, is enshrined. 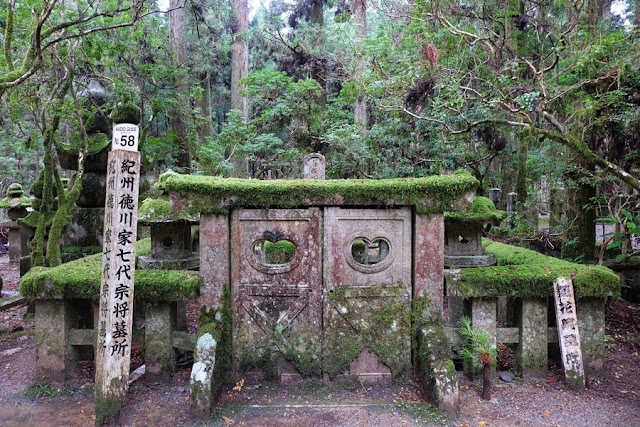 The altar also has memorial tablets for past emperors of Japan and Chief Abbots of Kongobuji. 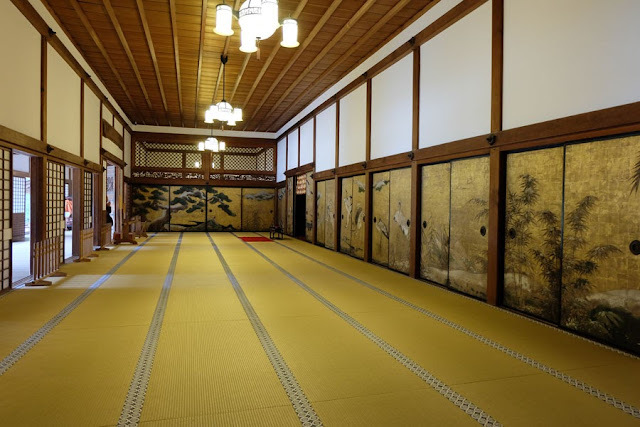 After the main hall, I admire six more smaller rooms with painted sliding doors; one room's fusuma is painted with plum trees, the other with willow trees, others with sceneries. Moving on to spot #10 on my map, the Shin Betsuden. 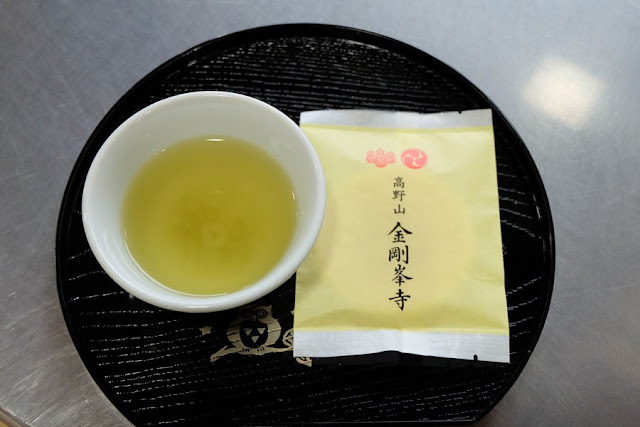 But before I enter, I am given a tray of green tea and rice cracker. I follow my fellow visitors into Shin Betsuden and sit on the side. Since I can't understand a word of what the monk is saying, I just munch on the cracker and drink my tea, then slowly tiptoe away once I'm done. I move further west in the temple and a very large and beautiful rock garden stops me in my tracks. 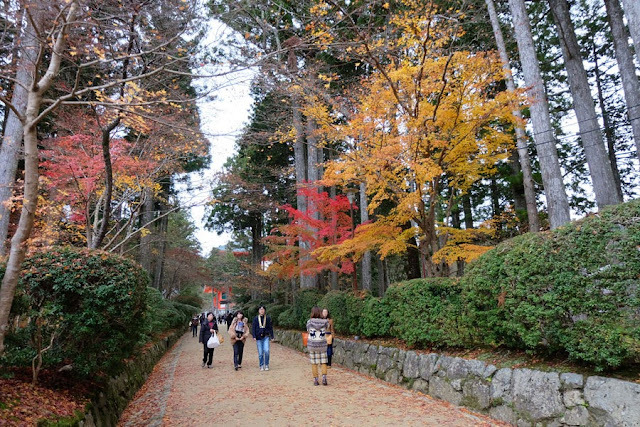 Banryutei Rock Garden, measuring 2,340 square meters, is the largest rock garden in Japan. I try to imagine two dragons emerging from a blanket of clouds...because that is what this rock garden is supposed to represent. I visit a few more rooms in the temple: the golden room called Shoin Jodan no Ma where Koyasan's major ceremonies are held; Okushoin, which used to be the resting area of the Imperial Family; Chigonoma, or the page room, where guards of the emperor stayed; Tsuchimuro, a room that was built coated with soil and a fireplace in the center; and, lastly, the huge kitchen where one can cook up a storm and feed up to 2000 people. Note: The fee is dropped in an unmanned box, so prepare the exact amount. 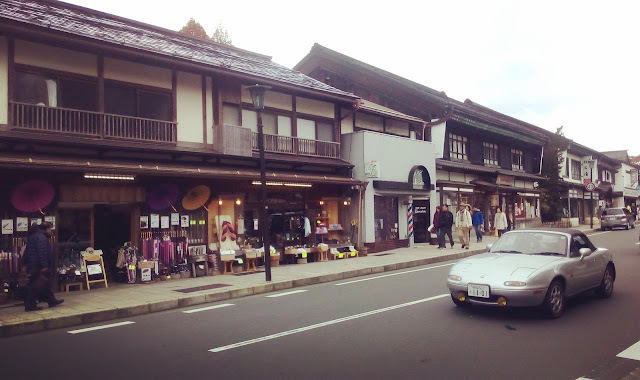 I leave Kongobuji and go to Koyasan's central temple complex called Garan. 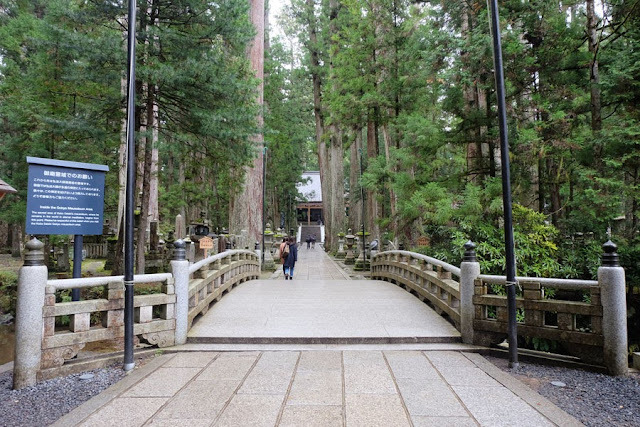 This is one of two of Koyasan's most sacred sites (the other is Okunoin, which is on the east side of town, near where I am staying). 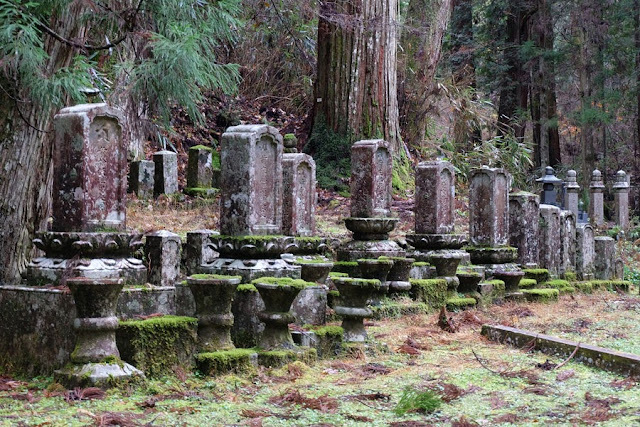 Garan is the first site Kobo Daishi built when he first started the monastery on Mt Koya. 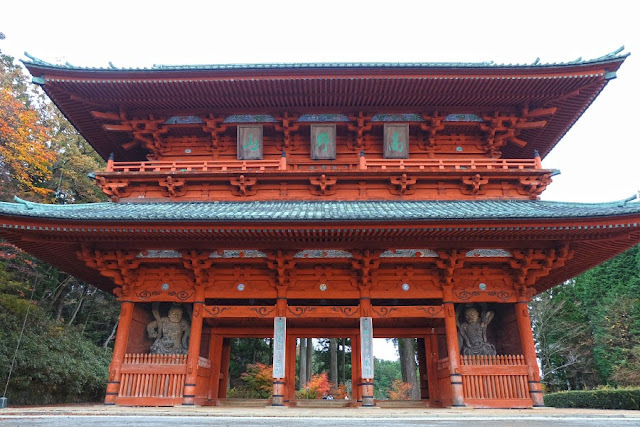 The temple complex has a gate (Chumon), but I enter on the east side of the complex where it is nearer to Kongobuji. 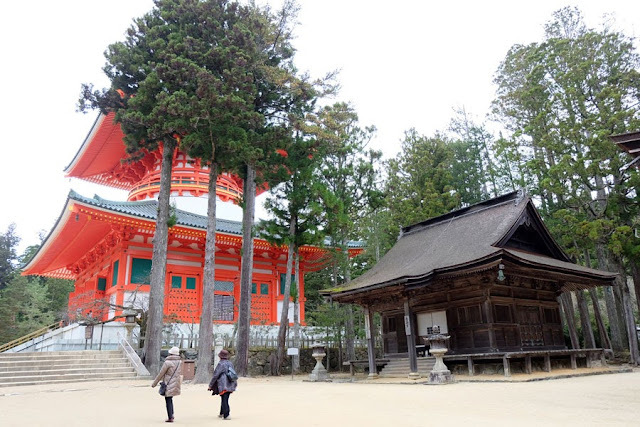 On my right I see a small red and white pagoda called Toto or East Pagoda, followed by three faded wooden buildings of different shapes and sizes: Sanmaido, Daiedo, and Aizendo. All these are closed. 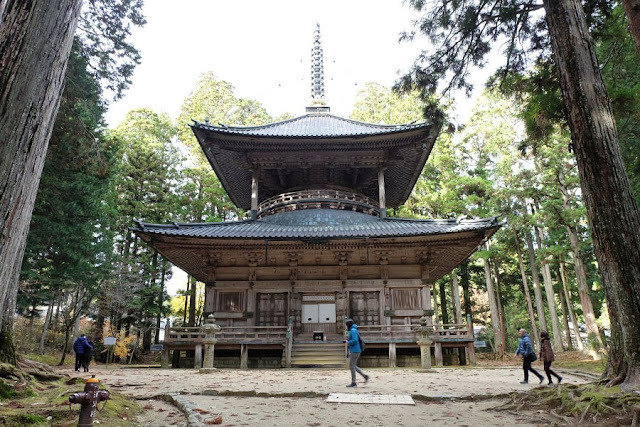 Opposite the Aizendo is another wooden building called Fudo-do. 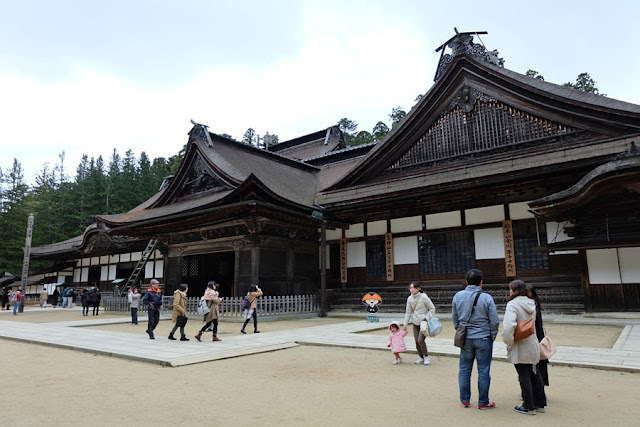 This is the oldest building in Koyasan, built in 1198. 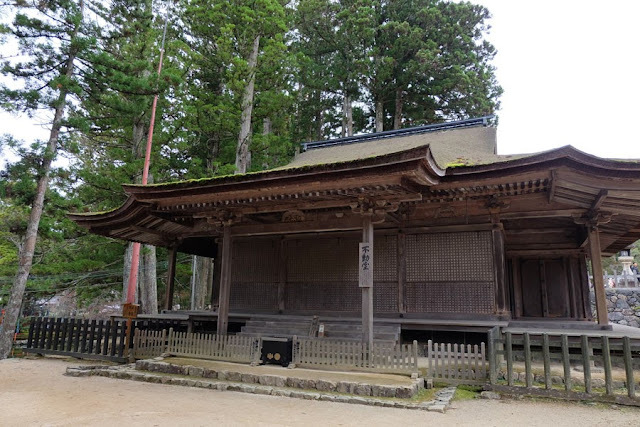 While I look at Fudo-do and wonder what's inside (this, too, is closed), I hear a chorus of voices, a captivating chant, and I hurry away to find the source. 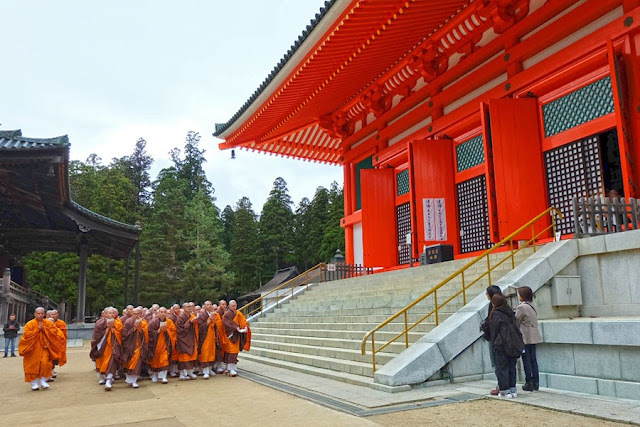 The enchanting sound comes from a group of monks gathered in front of Konpon Daito and I catch the last lulling notes as I reach them. 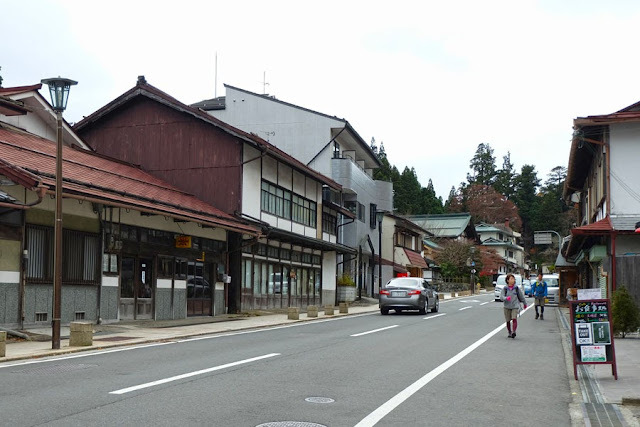 Near these two buildings is a pine tree (Sanko no Matsu) where I notice a lot of people are gathered, some bent at the hip, looking at the ground. 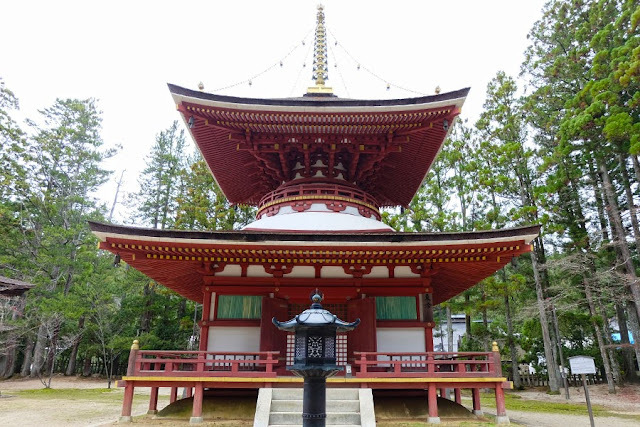 Legend has it that before Kobo Daishi returned to Japan from China, he threw his Buddhist ceremonial tool (called a sankosho) to the east and prayed that it would show him where to build his monastery. 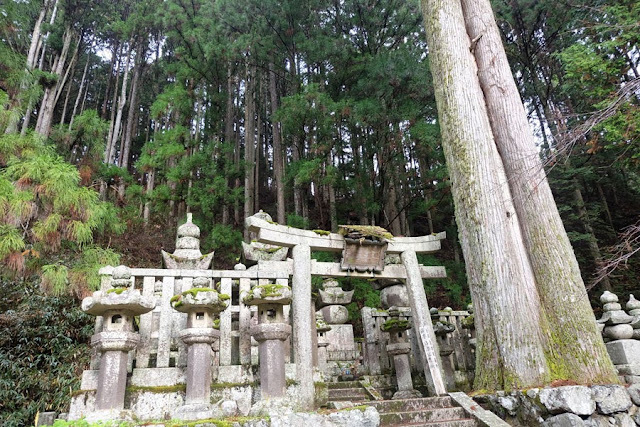 It is said that he discovered his sankosho stuck in this pine tree, a type that has three needles. 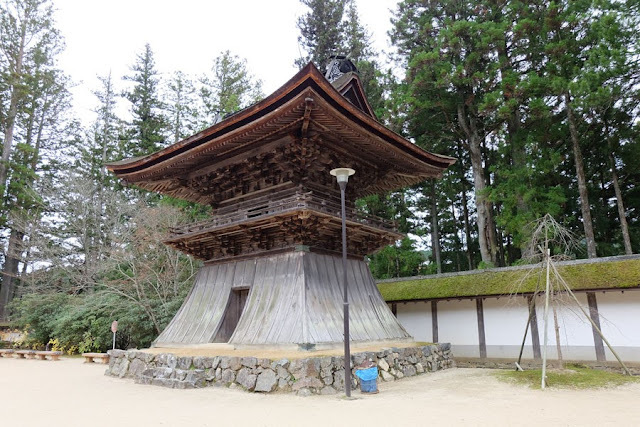 I explore the rest of the temple grounds and see more wooden buildings (all closed to the public) such as the Miedo or the Great Portrait Hall, which contains a 9th century portrait of Kobo Diashi and can only be viewed by the public once a year; Saito or the West Pagoda; and the Rokkaku Kyuzo, a beautiful hexagonal building that is said to house Buddhist scriptures written in gold ink on blue paper. There are handles on the base of the Rokkaku Kyuzo and I watch as two people strain their muscles trying to rotate the base. One rotates the base once he has finished reading the scriptures, but I am guessing these two are just curious how to rotate it. I want to give it a go but I feel I'd look funny doing it alone. I abandon the idea and give the temple complex a 360-degree look before I leave and proceed west to the edge of town. I know I am at the edge of town when I reach a two-storey, 25-meter tall gate. 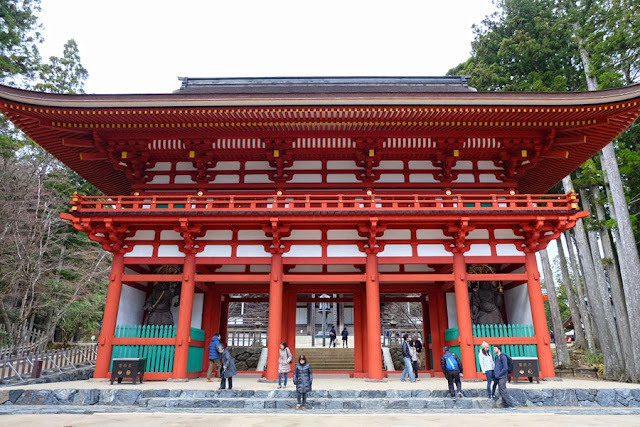 This great gate, Daimon, marks the entrance to Koyasan and the end of the 23.5-kilometer Choishi Michi Trail, one of the six pilgrimage trails in the Kii Mountain Range that are inscribed as UNESCO World Heritage Sites. The great gate is flanked by two Nio (guardians of Buddha). 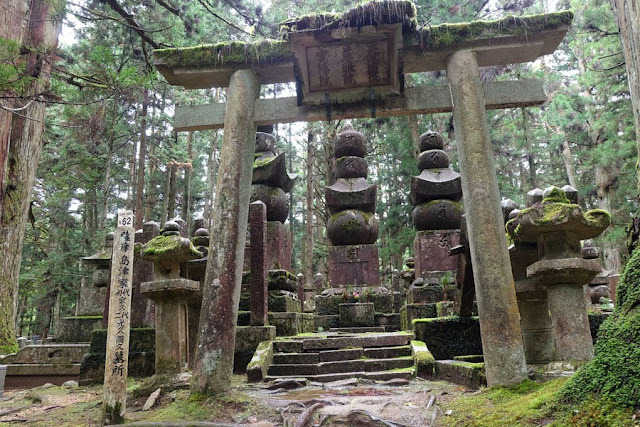 The Nio in Koyasan's Daimon are considered to be the second largest in Japan; the largest ones are in Todaiji in Nara. Now that I have reached the west end of town, I rest my legs and sit on a bench facing the magnificent gate and enjoy the cool late November mountain air. It is quiet, disturbed only by the sound of a car passing the road that bends around the gate. 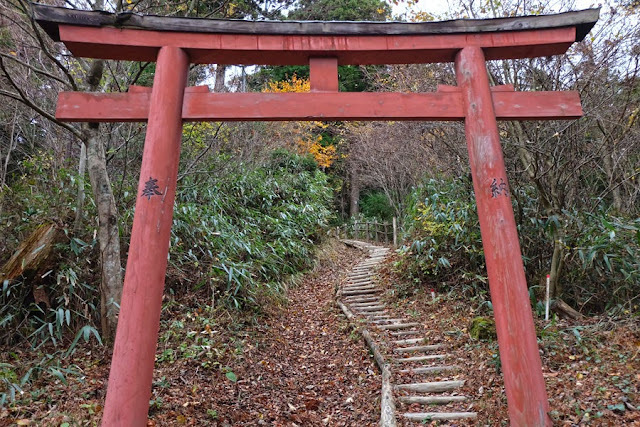 Two persons emerge from a small red torii off to my left and I remember it is the hiking trail the guesthouse staff recommended to take if I wanted a short hike (less than an hour). I glance at my watch and see that there is still plenty of time to reach the peak of Mt Bentendake before it gets dark. I start my hike. The ground is completely covered with brown leaves. Every step I make makes a crunching noise as leaves and twigs break under my big feet. I meet only one person and he is on his way down. I continue on. It's just me and nature. 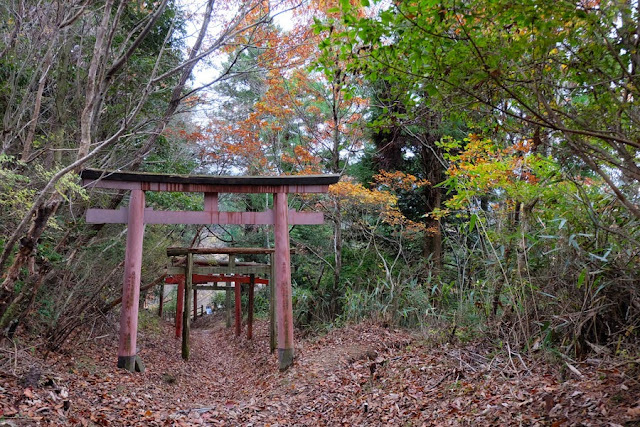 Trees, leaves, bushes, an occasional faded red torii. And then I see a sign. 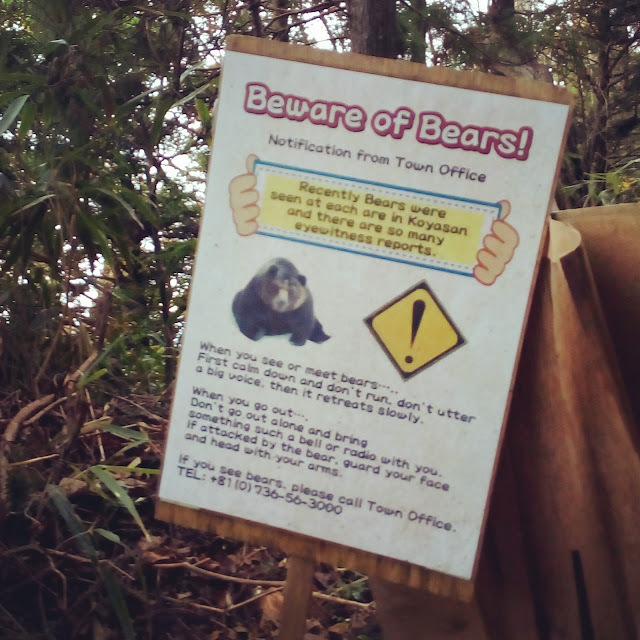 Upon closer inspection, it warns me that bears have been spotted in the area and not to hike alone and to cover my face if I were attacked by a bear. I take a photo of the sign and send it to my family WhatsApp group with the caption "to proceed or to go back?" I go on following the trail. I am a few hundred meters further up the mountain when I receive my sister's frantic reply: Go back!!! Her message bops some sense into me and I stop, look around, and think: I am alone. I do not see anyone ahead of me nor is there anyone hiking behind me. I don't have a bell to "scare" the bears. No one knows I'm here except my family and they are thousands of miles away...and maybe that guy who was on his way down, if he even had a good look at my face. Plus I am hungry. I want to feed myself and not be fed to the bears. I take a big gulp of fresh air and one last look up the lonely path, then turn around and go back down to civilization to look for food. 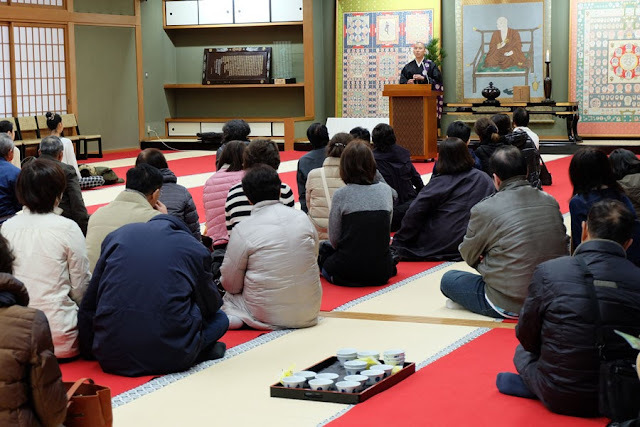 Koyasan Reihokan Museum 霊宝館 – a museum of Kongobuji's sacred relics, Buddhist images, and icons. Open from 830AM to 530PM (5PM from November to April). 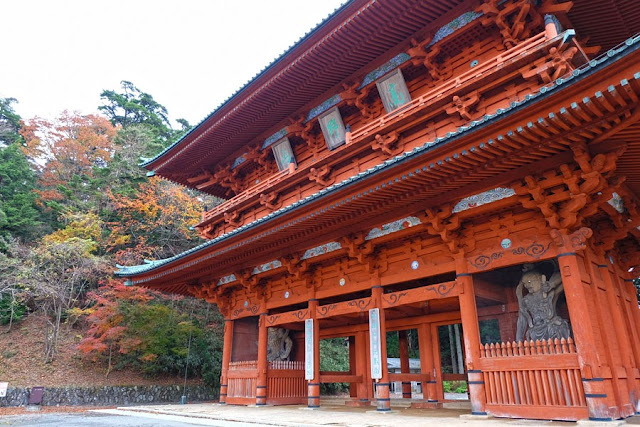 Admission fee is 600 yen (480 yen if with Koyasan World Heritage Ticket 20% discount coupon).